You've likely heard of it, especially if you read any men's lifestyle publication. 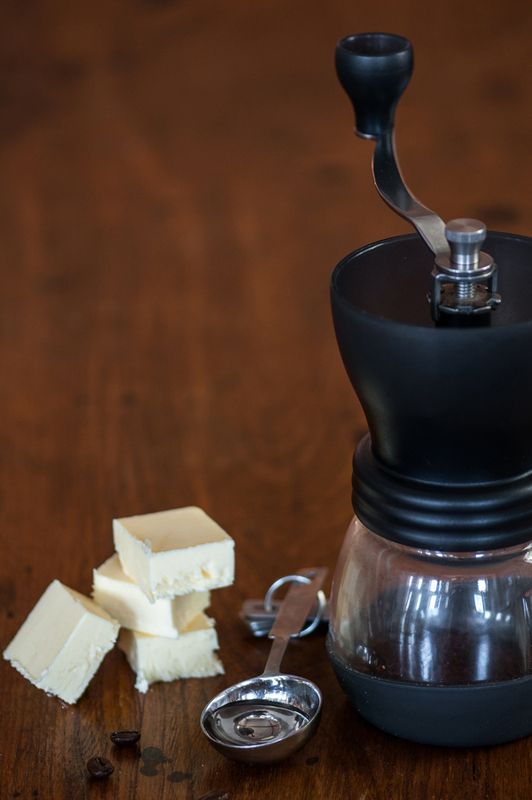 Wherever the name comes from, the recipe for Bulletproof Coffee is simple: take some perfectly good and delicious coffee, and add a whole bunch of fat to it, usually as butter or lower cholesterol coconut oil. I'll admit, I've been hearing enough about Bulletproof Coffee that I really am tempted to try it. Who knows, maybe this will be the key to my best year yet?There isn't much to what goes into a Bulletproof Coffee; it's just the abundance of fat that makes it a bit interesting... and a bit disconcerting. The idea is something like: give your body a whole bunch of fat first thing in the morning, and that teaches it to burn fat efficiently...or something. Why butter is better than traditional cream, from which butter is made and is often associated with coffee, is sorta unclear. But that's the recipe. I keep thinking about trying it, with both butter and coconut oil (premium, and unsalted of course). But then the actual morning happens and I just can't think of anything more depressing than ruining my morning roast. Here is the recipe, and I really want to hear if you think butter and coconut oil are valid additions to my morning routine. Have you tried it, and more importantly why would I want to? Leave your comments below, and look for my update on how it goes once I decide to try it myself. Thanks for the feedback everyone! It's definitely part of a larger routine change, and it's definitely something I will be implimenting at some point at least a bit. Right now I'm pounding protein shakes in the morning after my daily workout, so I'm not sure when I want to throw a wrench into something that's working well for me. And like @Spencer said, it's not just any ingredients, I've heard that Kerry Gold organic unsalted is the way to go, and might as well stick to organic on the coconut oil as well. I really love to hear from you all as readers, thanks for taking the time to drop a line! I'm a fan although I don't drink it all of the time. The idea of it is to use it as part of an intermittent fasting routine. Therefore you can drink this instead of eating breakfast and it will carry you through lunch time. I prefer mine with MCT oil instead of coconut oil. The trick is to blend it in the blender. That is the only way I will drink it, and no the lid will not fly off the blender because of the hot liquid. BPC isn't just any coffee. It's single origin water processed organic coffee, to be technically accurate. And grass fed cow's butter. But most will let that slide for more convenient and affordable ingredients. BPC takes some getting used to, but it's quite good! The coconut oil is smooth and tasty. It helps to make it in an insulated mug because it's less good when it cools and the coconut oil starts to solidify again. Also requires frequent shaking or stirring to avoid mouthfuls off oil. It's worth a shot! Don't be afraid! Butter in coffee is a horrible idea. What _is_ great is coffee (black) and any bread with butter and salt on it. Coffee enhances the bread and butter flavor and the bread and butter enhance the coffee's flavor. They're an amazing combo, just not in the coffee.